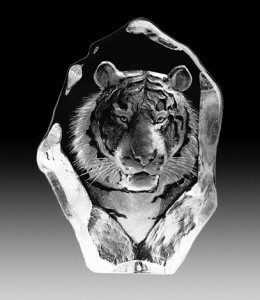 We carry some really beautiful, Swedish crystal figurines by Mats Jonasson which are perfect for gift giving and also popular as corporate awards and gifts. They are created in the small village of Maleras Sweden, known as home to some of the world’s finest crystal artisans. We have a video posted on our Mats Jonasson page if you’d like to see a bit more about how the pieces are made. The etching process on the detailed figurines is pretty amazing and starts at about the 2:35 mark. 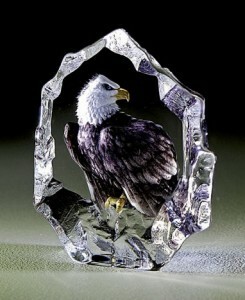 A couple of our favorite pieces are the beautiful Bald Eagle (item #33893) and Tiger (item #33567) shown below. There are too many great pieces to mention so we hope you browse through our Mats Jonasson home page and see for yourself!